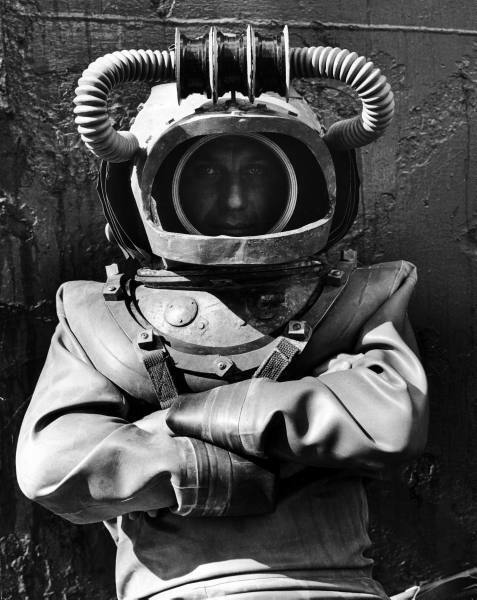 20,000 Leagues Under the Sea - in your face, Steampunk! Digging through LIFE Creative Commons, and there are some serious goodies in there (via The Best of Life blog). In 1954, LIFE sent reporters to the Bahamas to cover the filming of Walt Disney’s first live-action picture, 20,000 Leagues Under the Sea. The movie went on to win the Oscar for best special effects. Many of the photos in this gallery never ran in the magazine and have never been seen before now. There are more pictures from this gallery on LIFE, which are worth checking out in their original size (All pics are by Peter Stackpole, 1954). These images are crazy - it's bad enough getting the tube to work, imagine spending weeks under water in a serious diving suit, communicating only through notes scribbled on slates, probably really freezing most of the time too. And the production team looks massive - safety divers, props men, all working upside down and all over the shop. 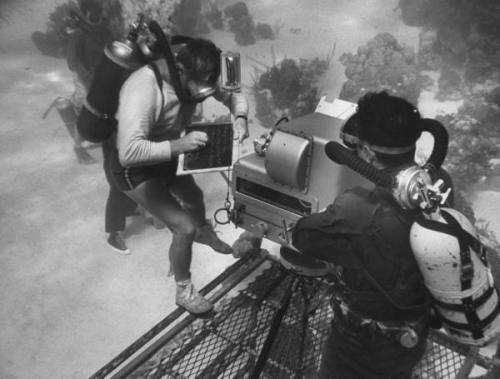 Director of operations writing instructions to the cameraman on slate during the underwater filming of Walt Disney’s production of “20,000 Leagues Under the Sea”. 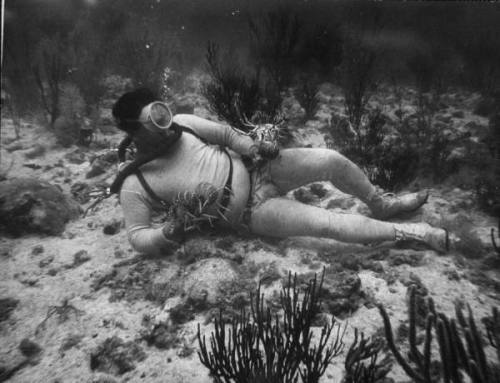 Propman with Crayfish during the underwater filming of Walt Disney’s production of “20,000 Leagues Under the Sea”. A propman waits for the proper moment in the scene to release two more crayfish into view of the camera. Shooting the Underwater Burial of Walt Disney’s “20,000 Leagues Under the Sea”. 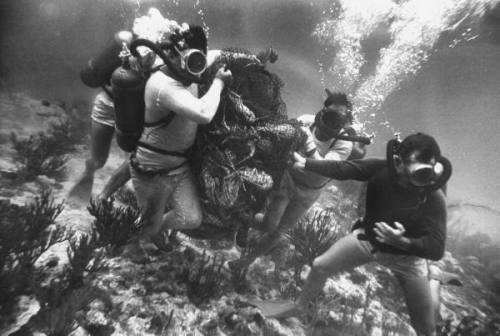 Actors prepare to shoot a big scene involving an underwater funeral procession while a scene coordinator hovers above them. The actors had to wait four weeks to shoot the scene, because bad weather made the depths too murky. Here's the communications chief napping during the underwater filming of Walt Disney’s production of “20,000 Leagues Under the Sea”. Salvage Man Frank Higgins grabs some shut-eye underwater. 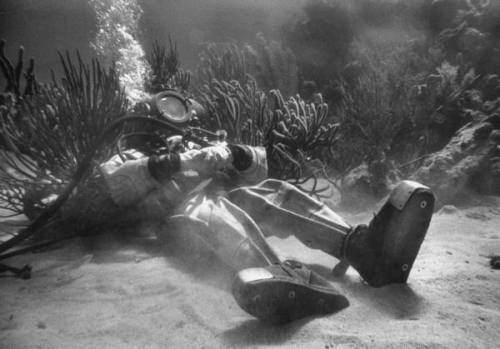 As the only member of the team whose suit had surface air-lines and a built-in telephone, Higgins was underwater for most of the day and had to grab rest whenever he could. 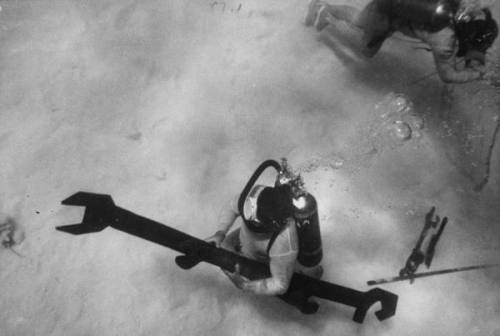 A propman carries a 9-foot wooden wrench during the underwater filming of Walt Disney’s production of “20,000 Leagues Under the Sea”. The wrench will be used in a scene where the Nautilus crewmen leave the submarine to repair a crippled propeller. Propmen —off-camera and wearing woolen underwear for warmth— drag a 400-pound net of Bahama crayfish across the sea floor for use in a later scene of “20,000 Leagues Under the Sea”. 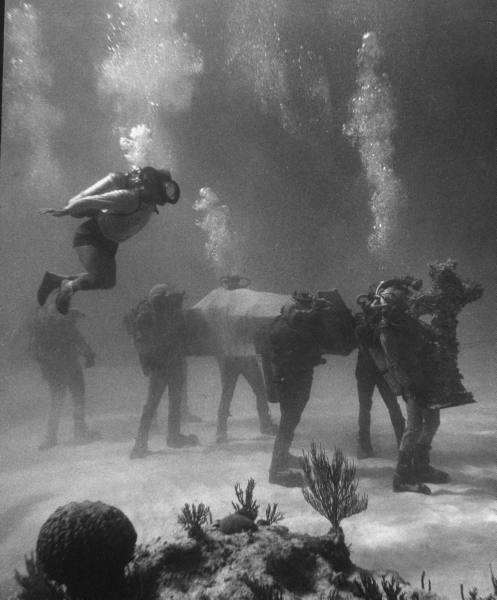 Scene from the underwater filming of Walt Disney's production of "20,000 Leagues Under the Sea". Big lead boots!